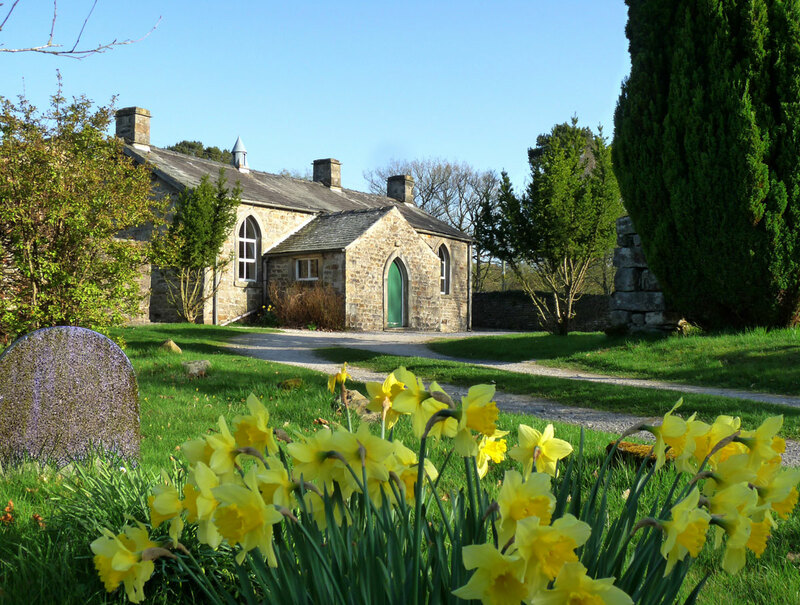 What is now commonly referred to as 'the Old School' is situated behind the Church of the Good Shepherd in Tatham Fells. It functioned as a school from 1863 to 1961, when it was replaced by the current school in Lowgill village itself. 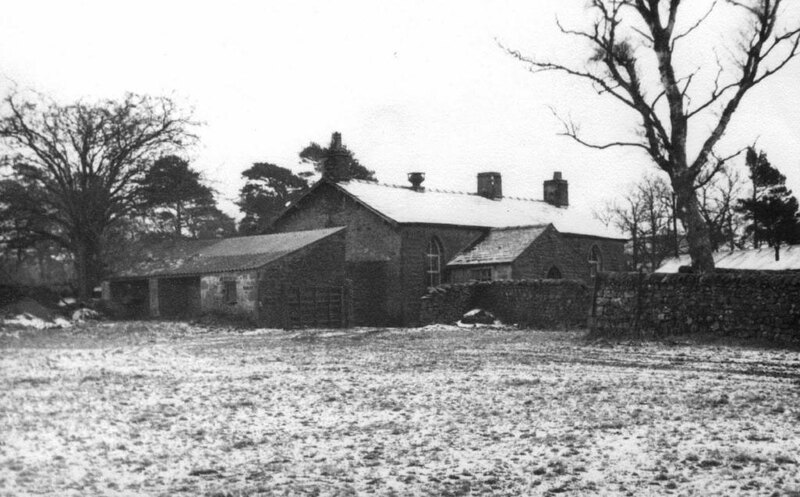 The building still stands and is used for events and meetings; indeed it is the only public meeting place in Tatham Fells. It is small and deceptively simple in design, consisting of just two rooms measuring 34 feet by 22 feet 6 inches and 20 feet by 14 feet with a front porch yet it was built in three stages between 1863 and 1896. Bronwen Osborne has used extensive extracts from the teachers' log book in her excellent little book, This Remote School to paint a vivid picture of the life and work of the school after 1875 and readers are encouraged to consult that for details. But the log book reveals nothing about the school's origins, financing and management; not until 1917 when the school managers' minute book becomes available is it possible to describe these in any detail. Nevertheless, it is possible to piece together something of these aspects of the school before then from local newspapers, parish records, the annual Return of Schools aided by Parliamentary grants and various files in the National Archives. That is what this article seeks to do, setting its development in the wider context of the changes in school provision which took place nationally at the time. No records of the fee-charging private school survive, so it is not possible to know what Mr Dixon taught. T. D. Smith in his reminiscences referred to wife, Margaret Davidson of Summersgill, attending the school and church in the 1840s as child. Accounts relating to the Sunday School for 1817-48 have survived and are now preserved at Lancashire Archives in Preston and from these it is possible to piece together a picture of the school's financing, activities and likely curriculum.9 The early committee was chaired by Revd Hodgson, with William Varley, treasurer, and members Henry Varley, John Parker, Arthur Cort, Christopher Langstroth, Gilbert Procter and Marmaduke Robinson. Major annual subscribers in the early years were members of the Varley family themselves; Mr William Dixon (till 1823 - possibly Miss Varley's fiancée); Arthur Cort of Lowgill House;10 and local clergy such as the Revds R Beaty, J. M. Wright (rector of Tatham) and J. M. Hodgson (curate of Tatham Fells). These and others in the area including Miss Alice Johnson and Miss Isabella Varley subscribed one penny weekly. These sums were supplemented by specific collections in the chapel after sermons by Revd Carus Wilson and Revd Hodgson. Revd Wilson's monthly magazine for children, The Children's Friend, was also purchased. This, too, was clearly evangelical in content but it also sought to make children aware of national, even global lifestyles, issues and debates, and the way in which the church sought to influence them. The issues for 1821, for example, explained what the bible reference to 'Take up thy bed and walk' meant by explaining what beds were in other countries. 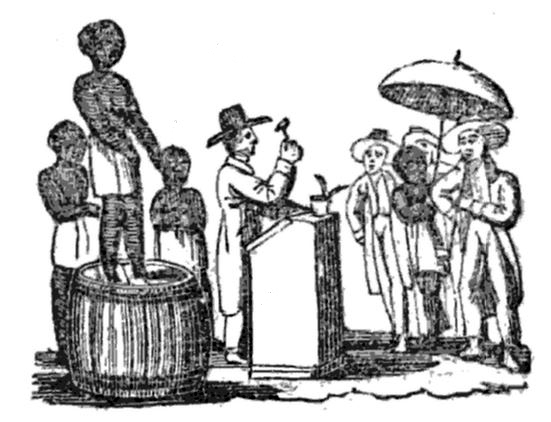 It also included moralising articles on missionary work in Africa, the slave trade, the mistreatment of black people, the ignorance of other races and attempts to convert them, and cruelty to children. You have heard of the Slave Trade. It is very cruel and very wicked. There were "menstealers" in St. Paul's time, and he classes them with "murderers of fathers and murderers of mothers, and manslayers and liars". And there are menstealers now: persons that go from Europe in ships to Africa, and carry from thence, by force, men and women and little children, and sell them by auction in the West Indies. Our laws do not allow Englishmen to do so now in any part, and we should bless for God for it. Although the main purpose of the school was to encourage Christianity, as in other Sunday schools of that period it is probable that children were encouraged to read, since that enabled them to access religious texts themselves. It seems highly unlikely that more practical subjects such as arithmetic and writing would have been taught on the Sabbath. The Sunday School continued to operate, albeit with a reduced income and attendance, until at least the 1870s when surviving attendance records end. By then, day school provision had been significantly improved and, as with the Sunday School, the church was to the fore. 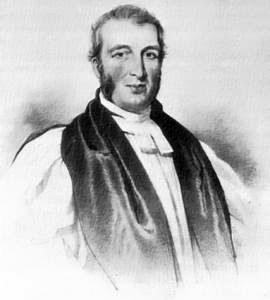 Revd John Matthias Hodgson, perpetual curate of Tatham Fells from 1839 and assistant curate earlier in the century, died 20 January 1862, aged 82. Revd James Chadwick, who was finally appointed perpetual curate in May, was very different from the men who preceded him, most of whom had been locally born. One suspects that he would have been appalled at what he found, but possibly inspired by challenge. A Rochdale man, he had graduated from Cambridge in 1848 and had previously been curate in much more prosperous parishes in Dukinfield (Cheshire) and Slaidburn. In the former a Church of England school had been established in 1844 while Slaidburn boasted a grammar school adjacent to the church, endowed by John Brennand in 1717 and with a dedicated clerical headmaster. He immediately set about improving facilities in the parish. Within a year of his appointment, he had raised over £84 in subscriptions to build a new school on the field behind Tatham Chapel. The subscribers were primarily the owners of farms in Tatham Fells and Botton, whether they lived here or elsewhere; only one them was simply a tenant. Heading the list of 52 donors with £5 was Chadwick's patron, the Revd John Marsden Wright of Lower Tatham rectory, but the largest donor with £8 was John Foster, the new owner of Hornby Castle, and lord of the manor, followed by Miss Remington (£6) and her brother William (£2) of Crow Trees, Melling whose family had owned Summersgill in Botton. Some landowners lived some distance from the parish: Henry Blackburn and Thomas Charlton, who owned the Hill and Spens estate and Oxenforth Green, were textile manufacturers in Halifax; Henry Rawlinson of Manchester was a relative of the late owner of Swans; John Fell, a barrister at Flan Howe near Ulverston owned Thrushgill and the plot of land called Williamsons. In addition, Chadwick was successful in gaining donations from individuals who were not local landowners: Messrs Gregson, Hinde & Co., the Lancaster-based owners of Wray silk mill, and their resident manager, John Dickinson; William Alcock, the barrister of New Field Hall, Gargrave and son of a founder of Craven Bank and a 'Mr Hamilton' of Preston. Five donors, all subscribing £1 or less, hailed from Slaidburn including the rector's wife and members of the King-Wilkinson family. (for full list see appendix below). Donations in kind came from Revd Thomas Livesey, previously headmaster of Bentham Grammar School who had married into the Cort family of Lowgill and inherited their properties there and at Stockbridge but who now lived in Worthing; he donated the sand for the building. Stephen Taylor and Robert Whitehead, farmers at Swans and in Lowgill, each provided a cart and horse for a day. Mrs Varley of Barleybank, John Langstroth of Knott Hill, and an unidentified 'Miss Woods' and a 'friend' gave £2 5s for a bookcase. Revd Chadwick designed and oversaw the construction of the school, with its fashionable Gothic style windows. It originally consisted of just one room, 'well lighted, lofty, and ventilated, with a strong boarded floor', and a small porch, 7ft by 6ft. The building contractors engaged to undertake the construction were Thomas Todd, stone mason of Melling, and George Grime, joiner of Wray, who also fixed and painted the spouts. Although we have no log books for this early period, we can glean a little about the operation of the school in its first twelve years of existence. Despite its close association with the church, the school was not officially a church school. It would also appear not to have been accepted as a school eligible for Education Department grants based on the result of government inspectors' annual examinations and reports about attainment in the 3 Rs. Such schools had to be run by a 'certified teacher' who had received appropriate training at one of the new teacher training establishments or had passed appropriate examinations while in service. William Dixon, the 66-year-old first schoolmaster, clearly did not fit into this category despite being potentially well-educated as a Cambridge graduate. He was possibly William, the son of Thomas Dixon, the yeoman poet of Low Bentham and quite likely was the same William Dixon who had subscribed to the Sunday School between 1817 and 1823 and then moving away from the parish.13 In 1861 he was a 'schoolmaster' living at Fourstones, with his wife and two daughters. Mr Dixon's salary was negligible, just 6s per week when the school opened. By June 1866, however, he had gone, and the trustees were advertising for a schoolmaster to teach 'reading, writing and arithmetic' at the rather low salary of £12 p.a. plus 'quarterage': the fees paid by parents who were not resident in the parish or whose children received tuition in additional subjects.14 Who, if anyone, filled the vacancy is not clear; there was no school teacher resident in Tatham Fells in 1871. By then, however, the school was facing a challenge to its very survival championed by the supporters of the Education Act of 1870. "Mr. Heditor, - I thowt as ow my eddication as been a good un, for my worthy faither ad a good lot self denial and spent a power of money over it. But, lord blass ye, I did find mysell short of the raal thing when I eard James Thomson, Esquire at our meeting tother neet. Ah, but I was sorry for 't lasses in our Tatham spot. i always thowt as James Thomson, Esquire had done somut toward the' eddication of em; but when I eard that he wanted um all to ave larning I thowt to mysell ah what clever bairns we shall have at Tatham. "And what a burning sham our chaps didn't do as James Thomson, Esquire wished um and pass thact. Why, it were to uproot poverty and crime. i was rather obfusticated about this un, axing your pardon, Mr. Heditor, is there a span new ploo found out or is it a spaid? Ah, but i shud loike to see it, for i is sorry for our poor lasses, and i is sorry to have so much to pay for poor rates. i never eard if mich croime in our parts; but James Thomson, Esqure is a deal wiser thatn me. i ave eard, Mr. Heditor, as ow th' Lancaster Corporation is going by this new ploo and uproort all papers and ave no crime. Ah, wat a nice spot you'll ave. I think I mun quit. 1848 and 1890 map comparison. The conditions of receiving the government grant included the appointment of a 'certified' teacher, the teaching of 'industrial' skills to girls and the compilation log of events, attendance and other matters pertaining to school operations. The logbook provides a vivid picture of daily life in the school and have been extensively used by Bronwen Osborne in her book on This Remote School.20 A register of children entering and leaving the school from 1892 has also survived.21 In terms of management and finance, however, we have only fragmentary records in the Education Department's records in the National Archives in London22 and stray references in the newspapers. Revd Chadwick wrote to the department in October 1874 asking for approval of their current teacher, Mr John Servant, and his wife, appointed in the summer after the death of the previous teacher, pointing out that he had served elsewhere in the county and requesting an inspection in January the following year. His request was either not granted or Mr Servant left voluntarily since Joseph Fieldsend was the first certified teacher to keep the required log book from April 1875, reporting that the standards of the pupils were 'very low'. He too left for more remunerative work in the November of that year. The school with 'offices' to the left of the building, mid-20th century. Just visible to the right is the roof of the wooden canteen building which was erected later. In June 1916 the new correspondent, Revd John Cort Livesey, a descendant of the local families of Cort and Livesey who had returned as curate in the parish from which his family hailed, became correspondent. He wrote to the Education Department asking for the name of the school to be changed to 'Tatham Fells Church School' on the grounds that the area had become a 'Statutory Parish', certified by H.M. Privy Council. His request was eventually granted but only after considerable head-scratching. The area had not become a civil parish, as Livesey's letter implied, but a district ecclesiastical parish. As such there were two objections. First, the department considered that the name of the civil parish also had to be included as 'Tatham, Tatham Fells'. As they admitted, however, 'the duplication seems rather stupid'. However, they had 'strong official objections to introducing C of E in the name where it did not occur at the time of the nomenclature change but to continue "chapel" would be wrong when the district has become a separate Ecclesiastic Parish'. 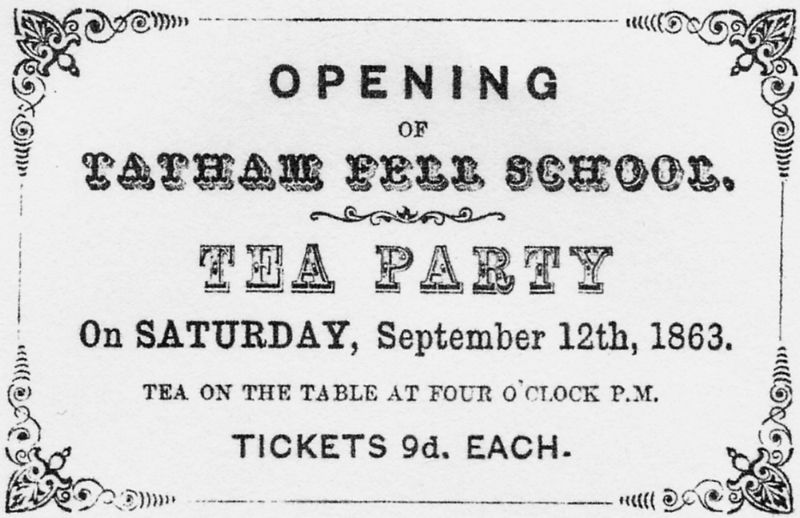 The official suggestion therefore was that it should be called 'Tatham, Tatham Fells C of E school' whilst acknowledging that the first Tatham would probably never be used. There had, apparently been a precedent for inserting C of E. However, they thought it would have been simpler if the dedication of the 'Good Shepherd' had been used. In many respects the experiences in Tatham Fells mirrored those in other rural areas at the time. In both Lower Tatham and Tatham Fells the Church of England had been only unofficially concerned with day schooling in the early 19th century, preferring instead to promote Sunday school provision. As elsewhere the increasing availability government grants and the need for regulation, combined with the threatened imposition of a nonsectarian School Board financed from local rates if provision was not improved, persuaded the church to make even greater efforts. Unlike many other parishes, however, the funding of new school provision did not depend on a grant from the Church of England National Society which had been founded in the early 19th century to assist with the building and running of Anglican schools. In Lower Tatham the funding came from the late rector's family; in the Fells it was raised by subscription. A similar pattern was evident in the rebuilding of the churches in the late 1880s. Unlike Lower Tatham where Robert Cluney was the teacher from the 1870s until his retirement in 1907, Tatham Fells also clearly struggled to find and retain teachers until the beginning of the 20th century. What is surprising, perhaps, is that the small building erected by Revd Chadwick continued to serve the needs of the district for so long without any substantial modification or improvement. Only in the late 1950s was it deemed to be completely unsuitable and steps were taken to build a replacement in Lowgill village itself. But it continues to provide a valuable function in the fells as the main venue for social and church occasions - and long may it continue to do so. 1 'A digest of parochial returns made to the select committee appointed to inquire into the education of the poor': parliamentary session 1818,. Vol. I (1819). p.437; 'Education enquiry. Abstract of the answers and returns made pursuant to an address of the House of Commons, dated 24th May 1833', parliamentary session, Vol. I (1835), p.461. 2 George Smith diary (in private hands). Bryan Holme died 1828. 4 Census returns, obituary notice in Lancaster Gazette May/June 1858. See also 14 March 1863. 7 Lancaster Gazette, 5 July 1856. 8 The Christian Guardian and Church of England Magazine (London: Seeley, 1822), 48-54. Reproduced in William Carus Wilson, A Collection of Tracts: originally published separately, and in the Christian Guardian (Kirkby Lonsdale: Arthur Foster printer, 1824), 124-34. Arthur Foster was printer, bookseller, and publisher and for nearly twenty years postmaster of Kirkby Lonsdale. 9 Lancashire Archives, Tatham Parish Records, Sunday School Accounts, 1817-48, PR2918/2/3. 12 Lancaster Gazette, 19 September 1863. 13 Born in 1797 he had been schooled at Richmond before entering St John's College Cambridge in 1815, graduating with a BA in 1820. He married in Tatham in 1824 the year after Miss Varley's death, describing himself as 'yeoman' but he had then moved around living in Skerton, just outside Lancaster, where he was described as a 'gent' in the 1830s, then in Liverpool working as commercial clerk. 14 Lancaster Guardian, 23 June 1866. 15 Lancaster Gazette, 12 and 26 August 1865; 15 September 1866; 13 October 1866. 16 Lancaster Gazette, 17 and 24 December 1870. 17 Lancaster Gazette, 29 July 1871. 21 A separate article on this is planned. 22 The National Archives (Kew) Education Department ED21/870916. 23 Revd Marshall to Education Department 27 April 1896; Education Department to Revd Livesey, correspondent, 22 August 1910, ED21/870916.